Originally published Jan 13/2014, updated Jan 12, 2018. I really didn’t like whole wheat banana bread. At all. I think it may have something to do with the fact that once, when I was in grade 2, my mom packed some in my lunch for my recess snack. I remember taking it out to the playground and trying to eat it while I was hanging upside down on the money bars. I then proceeded to drop said banana bread into the playground rocks. I then decided to listen to the “5 second rule,” and eat the banana bread anyway. It tasted like nasty, powdery, playground rocks. I have tried many kinds of bananas bread ever since my scarring experience, and all of them taste like rocks. I vowed to give up on it, and never ever, in all the evers, eat it again. That was until I met Mr.FFF. What’s his favorite snack? Paleo Banana bread. This is how this coconut flour bread recipe came about. I wanted the hubs to be all “you are the greatest wife ever” AND I decided that maybe it was a good time to get over my bread-y fear. Side note: That isn’t my weirdest fear. I am also terribly afraid of newspapers. But….that is a different story. One that you really don’t need to hear. Anyway, I also decided that it would be a good time to venture into the world of coconut flour. I had never made gluten free banana bread before AND I had never ever baked with coconut flour, so it clearly made sense to do everything I have never done all at once and make a paleo coconut flour banana bread, right? Just smile and nod. It makes me feel better. I then realized that it was a little crazy to expect to have a conversation with a baking product. Hey, can’t blame a girl for trying right? I threw a bunch of the usual banana bread suspects into a bowl, mixed it up and threw it in a loaf pan. If you use the right pan, it always turns out. That’s my motto and I am sticking to it. I crossed my fingers and popped this bread with coconut flour the oven. Then, I turned the handy dandy oven light on, sat down on the floor and just watched, hoping that it would rise and get all moist and soft. Or, at least look like a loaf. That was really all I asked of it. Set your expectations low so that they are easy to exceed, I always say. Except, that was the first time I have ever said that. But, you guys understand. HOW-EV-ER, setting my expectations low was the right thing to do guys. 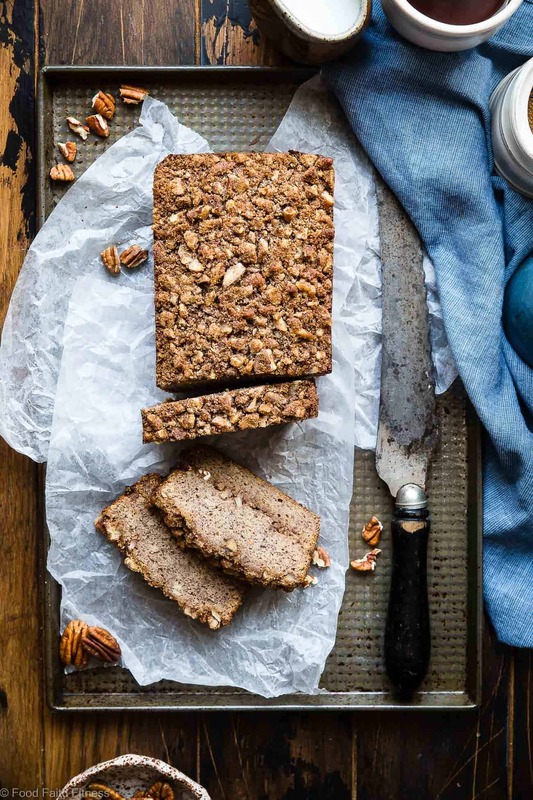 This paleo coconut flour banana bread. Oh my gosh. It does NOT taste like rocks. <– Mr. FFF said so, I promise. He actually said it was in the BEST paleo banana bread that he has ever had. Even better than the cacao paleo banana bread cake AND caramel stuffed paleo banana bread muffins!! As per all banana bread, using REAL RIPE bananas is the key here guys. Bananas already add super softness to baked goods, and then when you go and add EXTRA squishy, ripe ones? Extra super duper moist-o-rama! That was actually the hubs’ first comment – “it’s so moist!” The two other superstars here are the surprise crunchy bits of pecans inside, and the pecan streusel topping. Streusel, like butter, makes everything better. You agree. <– Especially when you combine crunchy, sweet (naturally!) streusel with moist, soft, and healthy x 4 billion, banana bread. Since this banana bread doesn’t rise as much as traditional versions, make sure a toothpick inserted in the center comes out clean and the top and sides are a deep golden brown. 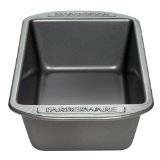 This means your banana bread is done! This banana bread is best sliced and then kept in an air-tight refrigerator in the refrigerator to keep it fresh. It will last about 5-7 days this way! It also freezes wonderfully if you want to keep it longer. 1) Not all banana breads are equal. It is possible to eat it without thinking there are rocks in my face. *As with all GF baking, please weigh flour to ensure results. Hahahaha – love life lesson #2, Taylor! 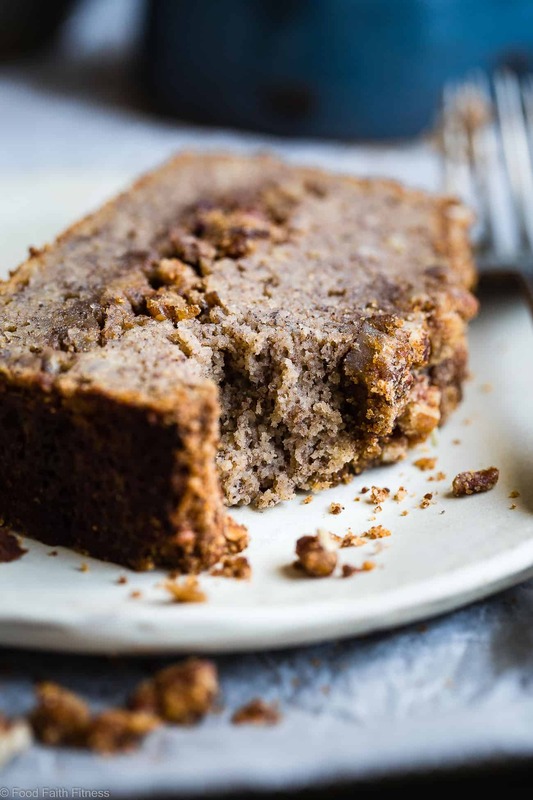 I would so love a slice of this Banana bread – I have yet to use coconut flour and must say the texture looks awesome! 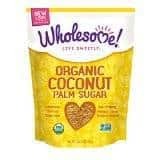 I was not aware of coconut sugar and now need to keep an eye out for it! Great job on this loaf! Girl, you need to try baking with coconut flour! It can be tricky…but the texture rocks my socks! I got the coconut sugar in bulk at Bulk Nation, I have yet to see it in a grocery store. Playground Rock Banana Bread, ha! Priceless! It’s funny how experiences like this can scar your impression of a food. This banana bread looks insaaane! I’ve never pre-glazed a banana and am all about trying this little trick now! I love using coconut flour for banana bread…it comes out sooo moist and dense and delicious. This is a definite must-make-soon! Confession: I had never pre-glazed a banana either, but it sounded good. You gotta try it lady! Trust me, it took me a LOOOOONNNG time to do this photo shoot! Haha Thanks for ‘nana bread love girl! Baahahaha poor grade 2 you! 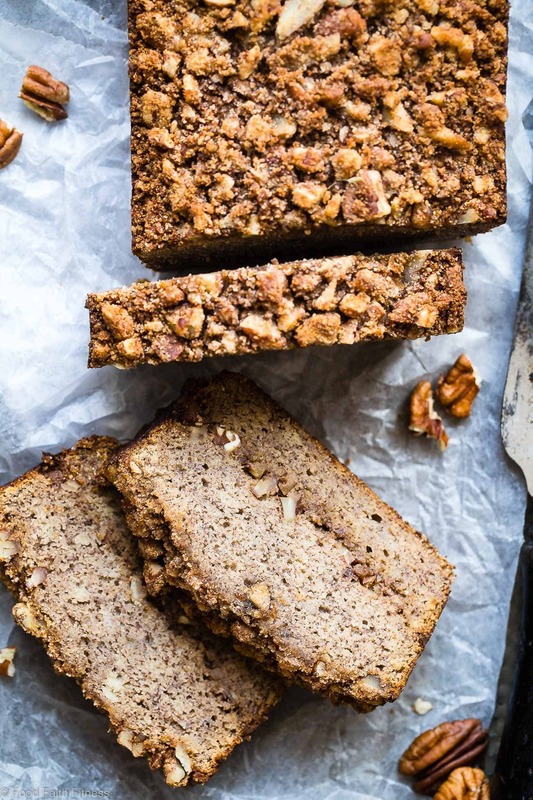 Thank goodness you hopped on the banana bread train – this looks fabulous! Oh my yum. 1) Streusel really does make everything better. 2) This looks incredible. Pinning. 3) I’m drooling over the lighting! How did you get such gorgeous light?? 1) Yes. you understand 2) Thanks girl! 3) It’s all in the camera setting and just praying that the natural light cooperates! I cannot believe you have actually created a banana bread that you like!!! I have tried sooooo many recipes since that fateful scarring accident and have always gotten the response “nope tastes like rocks to me”. This looks absolutely amazing and yummy! I’m glad that you have been able to make your hubby happy 🙂 Good job Tatey!!! Oh wow girl, you always crack me up with your posts! I’m picky with my banana bread too, but I’m sure I’d love yours since it includes caramelised bananas (!!!!!!) and streusel. I super duper wish I could hear about the fear of newspapers!! Taylor, you crack me up!! I am afraid of clowns. And bugs that move fast with many legs. And squishy things that touch my legs in the ocean. And … hmmmm … I seem to be getting off track here! This looks amazing! 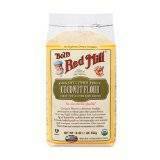 I’ve never baked with coconut flour, but I’m totally willing to try. We love banana bread at our house. And I love pretty much anything with a streusel topping! You’re right – streusel makes everything better! I am totally afraid of all the same things as you girl! Especially those squishy ocean things…GAH! gross. LOVE this recipe. Coconut flour is so good, in fact just made some apple cinnamon muffins using it! This recipe looks awesome Taylor, especially caramelizing the bananas. Totally would have never thought of doing that. My husband and I have been on this 21 Day fast with our church, and we are choosing the Paleo fast so I have been craving bread like crazy. Guess what, I have a slew of bananas at the house so this bread is going down either tomorrow or the next day. 🙂 Pinning, thanks girl! Those apple cinnamon muffins sound delish girl! Thanks so much for the kinds words! Glad I could help out with your craving! 😉 It’s cool that your church is doing that! Just read the list of ingredients, I know this has to be awesome! Gosh, that streusel topping is killing me! Oooh, glazed bananas! Totally haven’t thought about doing that before. I’m so impressed with your “baked goods whispering”…I’ve made banana bread many times and the first time I tried to create my own it was a big bust. Everything looked as it should coming out of the oven, but as the loaf cooled it deflated until it was a dense brick only about an inch tall. Oh well, can’t win ’em all! I hate when that happens! Everything looks amazing…until it comes out of the oven! Hey, at least you tried!! Haha love your life lesson #2. So funny! And listen Taylor, I think we need to delve a little deeper into this whole afraid of newspapers thing. PLEASE promise me you’ll tell us more about this fear in an upcoming post. I need to know! GLAZED bananas?!!??!?! You’re so smart. That sounds so delicious, and I love all the pecans because I love crunchy things on/in my banana bread 🙂 this looks so amazing! This would make amazing muffins too! Thanks for the sweet words Kelly! 🙂 If you get a chance to try it let me know how you like it!! Oh heeeeey… so um… when were you bringing this over again?! LOVEEEEE it. Hahah thanks Ashley! I would love to have banana bread girl party with you! Whoa! I’m so glad I found this. Banana bread is one of the things I miss the most since I had to cut out gluten. I’m loving this post lol! 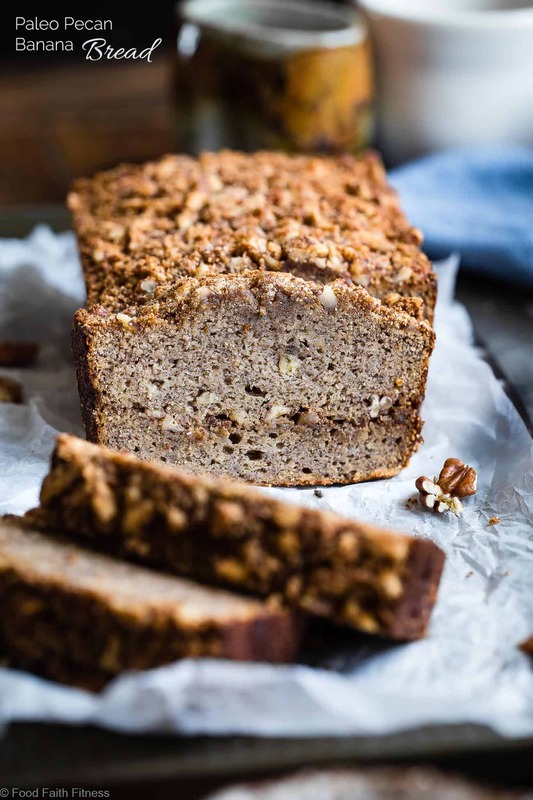 This banana bread looks delicious and the fact that it’s paleo is a plus! Seriously, this bread sounds fan-flippin-tastic!! 🙂 Love! It boggles my mind that a banana bread like this that looks so soft and moist could be on the healthier side! Love that you used coconut oil, honey, and coconut sugar in this bread—3 of my main baking ingredients that I almost always have in the pantry! Pinned! 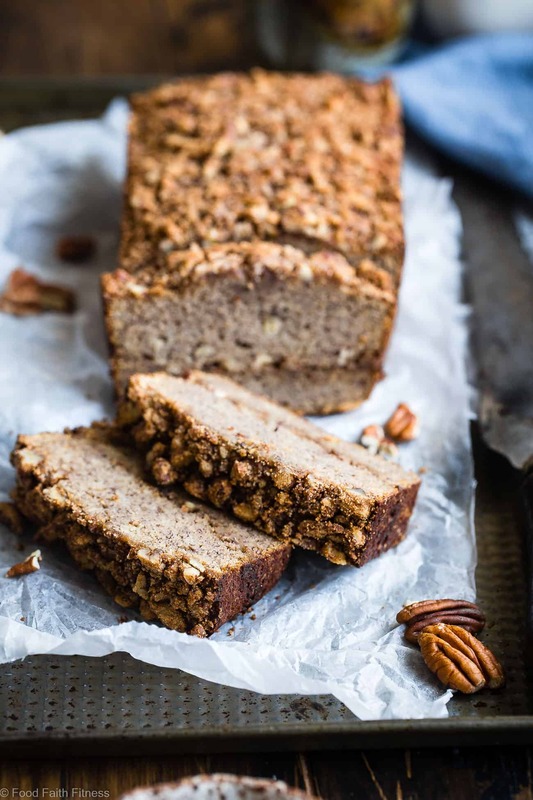 Very funny story….this looks yummy…I love the addition of the pecans….my hubby loves pecan pie but it’s way too sweet for me…I love banana bread…this looks like a mix of the two but healthier for you. Thank you. Maravilha! Vou fazer. Thank you!!! OMG that is the greatest idea, I have to try it!! Thanks Tash! Wait a minute. Are you sure that’s paleo because it looks like real bread! I am once again amazed at how talented you are at recipe development, Taylor. This looks amazing! 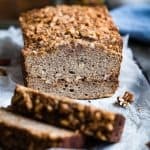 I’ve always made banana bread with chocolate chips (a recipe from my father-in-law when we got married) but this sounds delicious and definitely healthier!!! So beautiful. You’re reminding me that I have coconut flour, and I really need to break it out again. 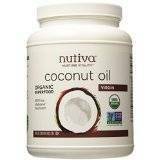 do you think this recipe will work using flax eggs as a replacement? Honestly, I don’t. Coconut flour is super tricky and really needs those eggs! I can’t guarantee it won’t work, but my gut says no. I am sorry! Let us know if you try it though! I just found out that like your husband I can’t eat wheat or dairy so I gave your recipe a try. It’s the first thing I ever baked in my life so I kept it simple by just making the bread without the struesel and pecan center. It tastes great. Only thing is the bottom is really wet (from the honey I’m guessing). Would baking it longer next time solve the problem or do you think I should use less honey? Not exactly sure what I did wrong so any advice would be appreciated. And again, it tastes amazing regardless, so thank you. I am so glad it tastes good! That is very strange, as I’ve made this recipe millions of times without a wet bottom. It WILL be a little moister than normal bread though – I will say that! Did you weigh your flour? It sounds like it might be an issue of not enough flour! 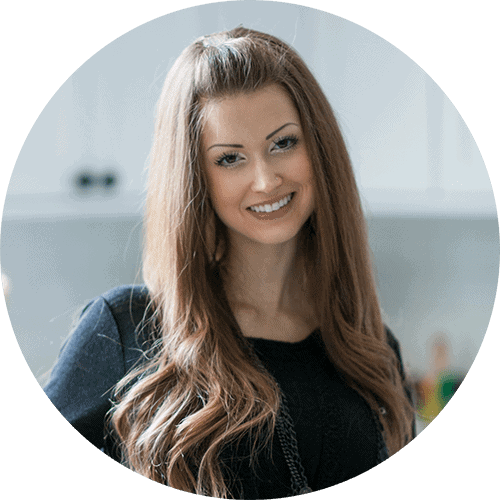 I just started a grain free lifestyle for health reasons and finding this recipe and your website has given me hope. I made this today and trippled the recipe because I knew my husband and kids would eat it so fast. We didn’t have the ingredients for tge strussel but even without it is delicious and so moist! My three year old son says he wants it every day!! Lol! I don’t like to cook or bake but at least knowing there are good ingredients in this made it more enjoyable. I’ll be trying your other recipes soon! Can this be made with an egg substitute? Like a flax egg? I can’t tell you as recipes are only tested as written, I’m sorry! Coconut flour really needs eggs though, so I would be really wary to try it! Let me know if you do! Thanks for the recipe. This had way too much cinnamon for us. I would probably do 1 teaspoon rather than a tablespoon. My husband likes a lot of cinnamon, so I left it as is but he said it was too much for him as well. That can change it for sure! Also, did you weigh your ingredients ?